Here we’ve provided details of some of our favourite small corded electric strimmers available on the market today. Below you’ll find a handy comparison table comparing the key features to look for when buying a strimmer, and below that a more detailed reviews of each model in the table. Electric strimmers are the cheapest strimming option available if you’re looking to tidy up the edge of you lawn or elsewhere your lawn mower won’t go. If your lawn is very small and you only wish to cut the grass once a week or so, then an electric strimmer is going to be more than suitable for your needs. With simple to use controls, typically just a single trigger button, electric trimmers couldn’t be simpler to use, and these days with ergonomics well considered in all consumer devices, they’re always comfortable to hold, even one handed in some cases. In addition, because they are only designed for small lawns, you’re not likely to suffer from vibration induced discomfort resulting from long periods of use. Electric strimmers also tend to be lighter and smaller than cordless and petrol models, so for the elderly or those who are less confident operating power tools they are also ideal. Storage is also easy, and with suitable brackets installed in your garage you can easily hang your strimmer on the wall with minimal effort. The most basic electric strimmers tend to use a single strand of cutting line to cut grass, whereas more powerful versions use a double strand, effectively possessing twice the cutting potential with every rotation of the cutting head. When browsing through the specifications of various electric strimmers it’s worth paying attention to this fact, if your grass is particularly thick and rampant then a double line strimmer is going to prove far more effective. Although Bosch Lawn mowers are pretty adept at cutting harder to reach areas of your lawn thanks to innovative features such as grass combs, and a low profile deck design, there are some scenarios where a you will struggle to cut the grass, for example in narrow areas, under benches or tables, or just where weeds have grown high or out of control. In these scenarios a strimmer is always going to be your first port of call, and if your garden is small the Art 23 is the obvious choice. Designed with a range of users in mind the Art 23 features a height adjustable shaft, making it comfortable for use whether you’re tall or short, and at only 1.7kg in weight, just about anyone will be able to use it without getting tired arms. To reiterate our earlier point we’d say this strimmer is ideally suited to small gardens, and occasional use. Some users have complained that it’s prone to breaking and jamming, but whether this is through over zealous use isn’t clear. What is probably fair to say that swathes of very thick long grass are going to be beyond the capability of this strimmer, so you’ll need something more robust and powerful if this is what you’re up against. So whilst this isn’t the sturdiest strimmer on the market, the price tag reflects its intended use, that is for the seasonal trimming of light undergrowth in small gardens. There seems to be nothing but praise for Black and Decker’s offering to the small strimmer market, and it isn’t hard to see why. Functionally this strimmer looks as though it means business, and features such as a powerful motor and an ‘edging wheel’ all make a big difference to achieving accurate and thorough results. How so you ask? Well let’s look in a little more detail. Just like Black and Decker lawn mowers, this strimmer also boasts a high torque ‘E-drive’ motor, this means you can chomp your way through some fairly substantial foliage without having any concerns about the motor stalling or jamming, and furthermore the 30cm cutting swathe is large for a strimmer of this size, so you’ll also be cutting through this foliage at a substantial rate. When adjusted for edging mode this strimmer ensures that you get consistent results by the inclusion of an edging wheel. This takes the onus off of you holding the strimmer at a steady height as you cut, instead you simply rest it on the wheel and only have to worry about guiding it from side to side. It’s a simple feature, but far from being a gimmick it’s extremely useful! Being an appliance of its age this strimmer doesn’t shy away from modern electronic wizardry, the cutting line is automatically fed from the spool and the motor automatically slows down when configured to edging mode, which Black and Decker claim is better for control when carrying out this task. Like the majority of consumers we think this is a top notch piece of kit, we might even go so far as to say it’s the best small strimmer available on the market… but there again there is always room for improvement! Quite honestly though, it does seem as though the engineering brains behind this strimmer have considered everything, from ease of use to ensuring that it’s rugged enough to last and not cause you many, if any head aches. Experience tells us that it’s a rare product indeed that covers everything, so this is a winner in our eyes. An attractive and ergonomically designed piece of hardware, this strimmer is also extremely lightweight, although it should be noted not to the extent of the Bosch model. None the less, most people shouldn’t have any problem manoeuvring this about their garden. The mechanism for rotating the head into ‘edging mode’ is remarkably simple, that is it involves the simple push of a button rather than the need to manually turn the head like on some older models. The 12 metre of cable is fairly standard for small strimmers, and will be more than adequate for the small gardens the strimmer is intended for. Likewise the 23cm cutting diameter, whilst not the largest, will mean that you’re not stuck with something overly cumbersome, both to use and store. As we hinted at above, many users have had major headaches with the line spooling ‘bump’ mechanism jamming or proving ineffective, and it seems to be a bit hit and miss whether you’ll have problems with this or not. This probably says something about quality control in the Flymo factory, although we wouldn’t like to speculate too much! 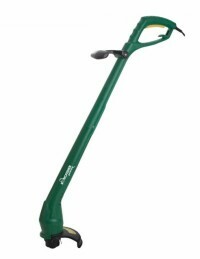 With looks more like that of a larger petrol driven strimmer, this 600 watt electric model may not be as powerful but it certainly boasts many of the same great features but at a fraction of the cost, not least the large 30cm cutting diameter that will allow you to work comfortably even in larger gardens. Knowing that vibration can be a real issue when using strimmers Ryobi have taken their time over getting the ergonomics right with the RTL6030, the front handle is fully adjustable to accommodate a variety of users, and both handles have rubberised grips for maximum comfort. To switch from strimming to edging mode and back again is a simple case of pressing the specially designed pedal behind the cutting head, we prefer the simplicity of this method over buttons at the handle end, as there is less complication in the mechanism, meaning less to go wrong, but it’s just as user friendly. 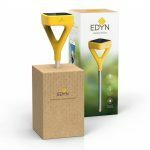 One of the cheapest strimmers in our round up, this model is perfect if you’re literally only concerned about ‘tidying up a small garden, the 250 Watt motor is only designed to cope with grass of moderate length (20cm tops in our estimation), and it doesn’t feature some of the more robust elements as more expensive models such as a large guard for the cutting line. So don’t be surprised if pushing this thing beyond it’s limits causes issues. None the less, as mentioned this strimmer is cheap, one of the best value strimmers money can buy. It’s also incredibly lightweight, so it’s a breeze to use, and just the job in a small area.